Fill the gaps in your Lenten and Easter ritual moments with liturgical music from acclaimed Catholic composer Father Ricky Manalo. Beyond the Days isn't your typical music for Lent, Triduum and Easter. Bringing a unique understanding of the relationship between the musician and the liturgy, Ricky offers liturgical pieces as "solutions" to ritual moments found throughout the Lent and Easter seasons; many of them fill specific liturgical niches for which little music exists. Ricky uses a technique which he calls "structural composing" to thematically link the various pieces on Beyond the Days. The key signatures of most of the songs have an inherent structural flow that outlines the movement from Lent to Easter. This connectedness culminates in the Lenten psalms, where the melody and refrains remain the same but the text changes from week to week. In addition to providing continuity appropriate to the season, "structural composing" makes it easier for the assembly to participate because they don't have to learn a new melody each week. This collection is a must-have for the Lenten and Easter seasons. Beyond the Days isn''t your typical music for Lent, Triduum and Easter. Bringing a unique understanding of the relationship between the musician and the liturgy, Ricky offers liturgical pieces as "solutions" to ritual moments found throughout the Lent and Easter seasons; many of them fill specific liturgical niches for which little music exists. In addition to providing continuity appropriate to the season, "structural composing" makes it easier for the assembly to participate because they don''t have to learn a new melody each week. This collection is a must-have for the Lenten and Easter seasons. With a keen understanding of the relationship between spiritual musicians and liturgical leaders, Father Ricky Manalo has turned his considerable talents toward filling liturgical niches within the Lenten, Triduum and Easter seasons for which little or no music exists. 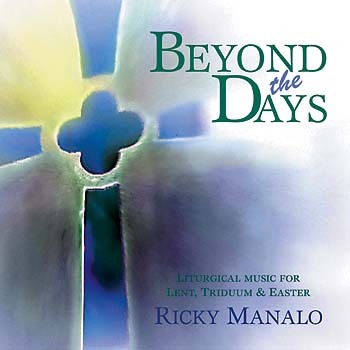 By thematically linking the songs featured on Beyond the Days, Father Ricky provides structural composition throughout the key signatures that allows the tracks to flow together and outlines the movement from Lent through Easter. This creative technique culminates in the delivery of the Lenten psalms, wherein the melody and refrains stay the same, but the text changes to allow them to be sung from week to week. The accompanying songbooks provide everything necessary to aid the choir as they lead the assembly in the singing of these songs. The easy-to-learn, repeating melodies in this must-have resource will be a welcome addition in any parish for the Lenten and Easter seasons.